It’s Only Monday and this Alinea–Cat Cora Drama Is Already So GoodAll this over a reservation! 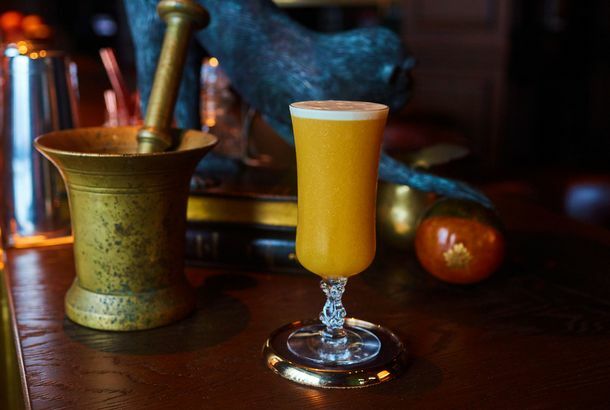 The Office Is a Curious, But Pleasant, New York Debut for Grant AchatzA hidden hotel bar with $23 drinks makes our critic eager to see what else the celebrated chef has in store. The Hidden Risks of Writing a CookbookThe cookbook business has a reputation for being strong and lucrative — a smart career move for any chef. The reality burns. Here’s What to Expect When Alinea ReopensHam hanging from the ceiling, and plates that look like they float. Fine Dining Is DoomedWhy would young operators deal with the complexities of haute cuisine when there’s plenty of glory — and money — to be had with cheaper restaurants? Details Announced for Alinea’s Residency in MiamiGrant Achatz will cook there from February 17 to March 13. Grant Achatz’s Alinea Will Head to MadridThe famed Chicago restaurant will run two different dining experiences in January. Alinea Is Celebrating Its 10th Anniversary With the World’s MostWould you expect anything less from Grant Achatz? Next’s 2015 Menus: Bistro, Tapas, and ‘Terroir’Tickets go on sale to the general public on Saturday. Can Thomas Keller Convince New Yorkers to Pay for Restaurant Tickets?The chef has some major changes planned for 2015. The Alinea Team Hired a Google Engineer to Beef Up Its Ticketing SystemNick Kokonas says all the details on the new company are yet to be announced. Here Are the 2015 Michelin Stars for Chicago; Grace Joins Alinea With ThreeThere are now two top-tiered places in the Windy City. This Strip Mall Café Dressed Up As a Pretentious Restaurant for HalloweenThe signature dish, “Flavors of a Chicago fall,” involves foraged Pringles and twigs. Here’s the Trailer for Next’s Modern Chinese MenuThe menu will be served through August. Guy Who Cooked the Entire Alinea Cookbook Wrote a Beautiful-Looking Book AboutFoams, gels, and stocks made out of Skittles. Turns Out Kids Are Still Capable of Ruining Meals at Nice RestaurantsGrant Achatz sets off yet another round of the kids-in-restaurants debate, even though there is really nothing left to debate. Next’s 2014 Menus: Steak, Modern Chinese, and ‘Trio’Ready for Grant Achatz to do “silky bisque”? 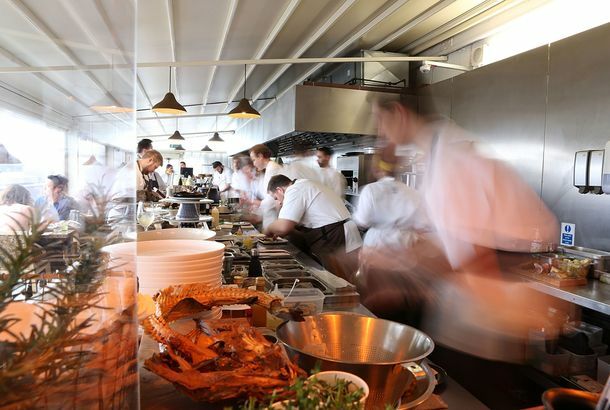 Michelin Releases 2014 Chicago Star RatingsThe city now has more starred restaurants than ever before. Michelin Chicago Results Released Early; Alinea Holds On to Three, Grace LandsThe full list is coming up shortly. 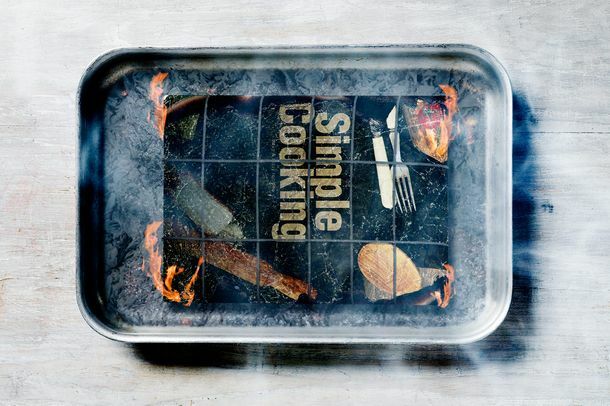 Grant Achatz and Alex Stupak Extend ‘Push Project’They’ll cook a themeless dinner on Friday. Grant Achatz Will Cook at Empellón Cocina Next MonthGet ready to push. 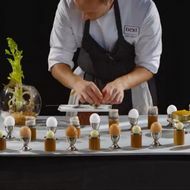 Here’s the Trailer for Next’s Bocuse d’Or MenuHow will Grant Achatz bring the white-knuckle culinary competition to an intimate dining-room setting? Grant Achatz Hints Alinea Will Find a Way Into Even More CitiesIt’s like Hydrocolloids: The Musical, but with less music. Service Included: 11 Restaurants Where Tipping Isn’t CustomaryIncluding Per Se, Next, and Chez Panisse. Matt Chasseur Steps Down As Alinea’s Chef de CuisineThe Chicago chef is moving to the East Coast. Chicagoans Tired of Tribune Critic’s Recurring Next RavesThen fine-dining innovation traps critics in a rut. The Guy Behind The Alinea and Next VideosWho makes those Next videos? He does. Alinea Wins Chef’s Choice, Named #15 on World’s Best Restaurants ListAlinea slips, but wins new honor, in World’s 50 Best Restaurants List. Video: Alinea’s New Toy Shows Off… Alinea’s New ToysAlinea video changes how you look at what they do. What Rene DeLeon Will Do, And Not Do, At Billy Lawless’s West Town ProjectSous chef Rene DeLeon has left Next for new Billy Lawless restaurant. Bon Appétit Says These 20 Restaurants Are the Country’s MostAn important list of important restaurants. Everyone: Taking Food Pictures in Restaurants Is Not That ComplicatedShutter to think. Wretched Excess: More Writers Complaining About the ‘Tyranny’ ofIt’s time to cool it with the tasting-menus-as-torture pieces. Watch Alinea Take Over Eleven Madison Park, and Vice VersaThis fall’s most ambitious culinary experiment now has a retrospective companion video. Watch a Clip From Spinning Plates, a New Food Documentary FeaturingJourney into the mind of Grant Achatz. Go Inside the Kitchen As Eleven Madison Park Takes Over AlineaWhat it’s like when two three-star Michelin restaurants come together. All Aboard! 21st Century Limited (That Alinea-EMP Thing) Ticket Process BeginsRegister for the Alinea-Eleven Madison Park tradeoff. Are Marc Vetri and Ken Oringer Planning Their Own Restaurant Swaps?The exchange between Eleven Madison Park and Alinea has chefs pondering their own restaurant swaps. Eleven Madison Park and Alinea to Swap RestaurantsCall it: Alinea Madison Park. Alinea and Eleven Madison Park Trading Places For a Week? Plus First KyotoAlinea and Eleven Madison Park are cooking something up. Alinea Ticketing System Announces Days You’ll Be Frantically Clicking On ItAlinea ticketing system announces the days when you’ll be frantically clicking on it. Alinea Opens Ticket Sales! Alinea Tickets Gone Already!Alinea goes to ticketing system.